L&T Infotech Placement Papers PDF Download 2017-2018 | Aptitude, Reasoning & Verbal Ability Model Papers. Are you looking for L&T Infotech Placement Papers? Then you have reached the right place. L&T Infotech Placement Test will have in-depth and deep rooted questions on Aptitude, Reasoning & Verbal Ability. Practice these sample questions based on L&T Infotech Placement Papers and see where you stand. Regular practice will improve your skills. Individuals will also get an idea about the L&T Infotech Test Pattern by practicing the sample questions. Practice the latest L&T Infotech Placement Papers with the latest syllabus of L&T Placement Test. Here we have gathered some sample questions based on the current format with new pattern questions as well as the ones based on previous years format. Questions based on Aptitude, Reasoning & Verbal Ability under the Section of L&T Infotech Recruitment Examination can be attempted here. Revise both answers and solutions to the sample questions as both can be useful. Individuals can download the L & t Infotech Model papers which consist of the list of commonly asked questions for L&T Infotech placement test in the Aptitude, Reasoning & Verbal Ability sections. The questions are gathered from the latest L&T Infotech Placement Papers. So the sample questions asked here are comparable to the questions asked in actual L&T Infotech Placement Test. 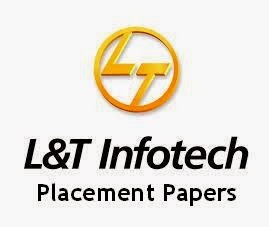 Below we have provided a direct link to download the L&T Infotech Placement Papers PDF. Aspirants can utilize the link and download the L&T Infotech Placement Papers PDF free of cost from our website www.allindiajobs.in. Aptitude test in L&T Infotech placement paper has some of the most tricky aptitude questions. Try your luck in solving these aptitude questions in a set of 15 questions and find out your chances of selection. 1. There are 6 boys Amit, Banhid, Dhruv, Chand, Harsh and Gaurav. They want to go out with 6 girls – Nidhi, Parul, Kruti, Naseem, Sujata and Radhika, not necessarily in the same order. each preferred by two pairs. Following information is given: – Amit and Chand visit circus, but don’t like pav-bhaji or pani-puri. – Gaurav can’t go with Sujata and Parul, as both of them don’t like chaat, but Gaurav does. – Naseem and Kruti want to go to movie and park respectively. – Dhruv goes with Radhika to beach, but does not chaat or pani-puri. – Banhid goes to a movie and eats pav-bhaji. Radhika does not like bhel. – Harsh cannot go with Nidhi or Parul and he does not go to a park. B.an analogy from the physical world to indicate a historic art movement. C.an analogy from the physical world to indicate the barrenness of artistic creations in the past. D.an embedded codification of pre-historic life. E.an analogy from the physical world to indicate the passing of an era associated with an art movement. 2. In the passage, which of the following similarities between science and art may lead to erroneous conclusions? A.Both, in general, include a gamut of distinct but interconnecting activities. B.Both have movements not necessarily concerned with innovation. C.Both depend on collaborations between talented individuals. E.Both reflect complex priorities of the modern world. 3. The passage given below is followed by a set of two questions. Choose the most appropriate answer to each question. or alternatively imposed upon it a posteriori — similar to that which exists under the umbrella of science where the general term covers a whole range of separate, though interconnecting, activities. Any parallelism is however — in this instance at least — misleading. A scientific discipline develops systematically once its bare tenets have been established, named and categorized as conventions. disseminated through many different channels of communication — seeds that often bore fruit in contexts far removed from their generation. Not all movements were exclusively concerned with innovation. from the exposures of painters, sculptors and thinkers to the more complex phenomena of the twentieth century, including our ever increasing knowledge of the thought and products of earlier centuries. into total chaos. Beyond this, new language tools have been created for those who follow — semantic systems which can provide a springboard for further explorations. The codifying of art is often criticized. Certainly one can understand that artists are wary of being pigeon- holed since they are apt to think of themselves as individuals — sometimes with good reason. environment from the messages codified into the structure of a fossil, so can an artist decipher whole webs of intellectual and creative possibility from the recorded structure of a ”˜dead’ art movement. patterns, but someone who is able to translate and develop them so that they confirm more exactly to his — and our — present needs. B.the dissemination of ideas through the state and its organizations. C.accidental interactions among people blessed with creative muse. A.landmarks which give a pattern to the art history of the twentieth century. B.new language tools which can be used for further explorations into new areas. A.we always carry forward the legacy of the past. B.past behaviours and thought processes recreate themselves in the present and get labeled as ‘original’or’creative’. C.’originality’ can only thrive in a ‘green house’ insulated from the past biases. D.’innovations’ and ‘original thinking’ interpret and develop on past thoughts to suit contemporary needs. 9. Once again, the Indian tradition of ”ahimsa’ comes out as infinitely most relevant, than much of what we learn in modern education. 10. When it was decided to send the rescue team in the colliery, the experts showed their reluctance. 11. In each of the following questions, there is a certain relationship between two given words on one side of : : and one word is given on another side of : :while another word is to be found from the given alternatives, having the same relation with this word as the words of the given pair bear. Choose the correct alternative. 12. Tile : Mosaic : : Knot : ? 13. Bread : Yeast : : Curd : ? 14. Command : Order : : Confusion : ? 15. Ruby : Red : : Sapphire : ? Usually the ascent of a mountain face is much easier than the………………. 17. More than twenty years have now passed………………..I had my first flight. 19. Once you suspect a person of double dealing, you ought to keep him at arm’s. 20. While strolling on Janpath, I chanced to meet…………..European. A) he has broken his pen, / B) and his paper is not yet complete, / C) but you can help him / D) if you give him your for an hour./E) no error. 22. A) This book is quite different /B) than the one I gave you, / C) because it is an old edition / D) and does not cover the whole course./E) no error. 23. A) He could come / B) if you invite him / C) well in time / D) in writing./E) no error. 25. A) He ought have tried his best / B) from the very beginning / C) because the goal he set before him / D) was not an ordinary one./ E) no error. 26. In each of the following questions, out of the given alternatives, choose the one which is nearest in meaning to the given word. Try to solve these reasoning questions in L&T Infotech placement paper and prepare for its upcoming recruitment or campus drives. Start now and improve your performance with each test attempt. 2. From his house, Lokesh went 15kms to the North. Then he turned West and covered 10kms.Then, he turned South and covered 5kms.Finally, turning to East, he covered 10kms. In which direction is he from his house? 3. What is the similarity between a structure, union and enumeration? Let the numbers be 3x and 4x. Then, their H.C.F. = x. So, x = 4. So, the numbers 12 and 16. L.C.M. of 12 and 16 = 48. The series is + 1, + 2, + 3 etc. The missing letter is (K + 4) = P. Skip Process: First no letter is skipped, then 1, 2, 3 etc. letters are skipped to get next letter. Skip 4 letters after ‘K’ to get P.
6. Read the following information and answer the questions given below it: (1)A, B, C, D and E are five friends. (2)B is elder to E, but not as tall as C. (3)C is younger to A, and is taller to D and E. (4)A is taller to D, But younger to E. (5)D is elder to A but is shorter in the group. 1.Who among the following is the eldest? In terms of age we have: E < B, C < A, A < E, A < D So, we have C < A< E < B, A < D. In terms of height we have B < C, D < C, E < C, D < A. Either B or D is the eldest. 7. If x – y + z = 19, y + z =20, x – z = 3, find the value of x + 4y – 5z ? 8. Which letter is represented by the no “5”? 9. Two people agree to meet on January 9, 2005 between 6.00 P.M. to 7.00 P.M., with the understanding that each will wait no longer than 20 minutes for the other. What is the probability that they will meet ? 10. What is the Cost Price of the article ? 1. After selling the article, a loss of 25% on Cost Price incurred. 2. The Selling Price is three-fourths of the Cost Price. The first statement establishes that the larger group constitutes half of the total amount of marbles, which means it must be equal to 25 marbles. The English Verbal Ability aspect is essential to the entire placement process of L&T Infotech. You need to score really good in this section as the technical positions require both technical knowledge and communication skills to communicate fluently in English. 1. Several villages, which were _____ by the deluge, were cut-off from the rest of the civilization. Villages can be ‘inundated'(submerged) in a ‘deluge’. 4. Being a strong adherent of _____ and modesty he resents any ostentatious display of wealth. 7. He settled himself ________ his arm chair. ‘To think on your feet’ means to be able to think and react to things very quickly and effectively without any preparation. 9. I shall visit the book fair tomorrow. 10. He can walk fast. He is tall. 11. The warden did not approve with the student’s behaviour. 12. The recent natural calamities not only produced casualities, it also triggered, emergency relief intended to address the life-threatening problems of survivors. 13. Most of the candidates are over-qualified for the post. Mohan is the only person who is the least qualified among them. 15. She is worried about his health and also me. Dear viewers, hope the syllabus and L&T Infotech placement papers provided here are useful to you. Sometimes companies may change their syllabus and exam pattern. So check our website www.allindiajobs.in periodically for the latest syllabus. In order help our reader we regularly update our articles wit the latest information.